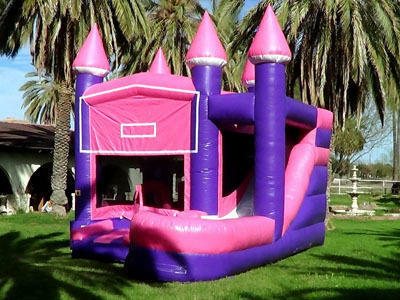 This Pink & Purple combination Bounce and Slide has a bouncing area with Pop-ups and an Arch for extra fun. Climb up to the side mounted slide that can be converted to a Water Slide for just $75 more. This Combo can be themed with any of our standard banners for $10 or any premium banners for $20. This Bounce has an inflatable step and a Basketball hoop inside for your young Superstars.